In 1902, Theodor Herzl, the founder of political Zionism, wrote to Cecil Rhodes, the Minister of Colonies for Great Britain: “You are being invited to help make history. It doesn’t involve Africa, but a piece of Asia Minor; not Englishmen but Jews … How, then, do I happen to turn to you since this is an out-of-the-way matter for you? How indeed? Because it is something colonial.” The occupation of Palestine was the last settler-colonial project the British empire commissioned, and this colonial project is still unfolding more than one hundred years later. 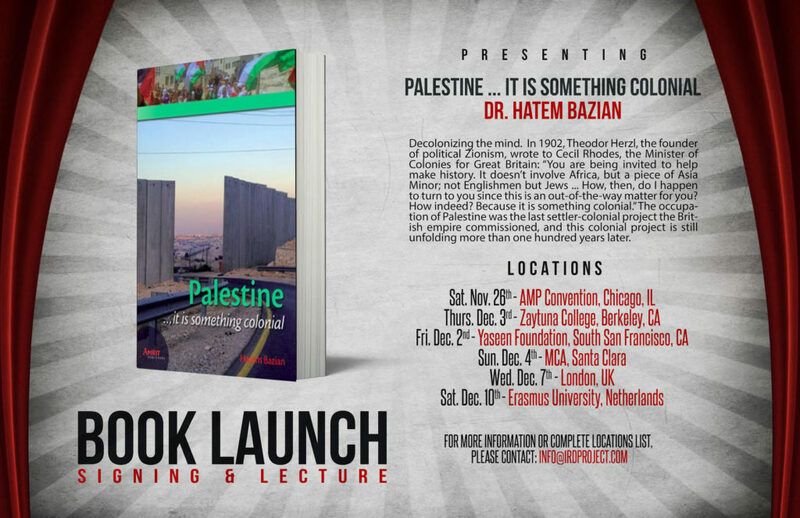 In centering Palestine’s modern history around settler-colonial discourses, Hatem Bazian offers a theoretical basis for understanding Palestine while avoiding the pitfalls of the internationally supported “peace process” that, on the one hand, affirms settler-colonial rights and, on the other hand, problematizes the colonialized and dispenses with the ramifications of the colonial project. Saturday, November 26 – AMP Convention. Chicago, IL. Thursday, December 3 – Zaytuna College. Berkeley, CA. Friday, December 2 – Yaseen Foundation. South San Franscisco, CA. Sunday, December 3 – MCA. Santa Clara, CA. Wednesday, December 7 – London, UK.